When Sales and Operations are on the same page and managing delivery on time and as promised, the customer keeps coming back for more. Your Operations people have one schedule board. They schedule tickets based on the estimates you win. Aspire tracks every ticket to ensure that every service goes on a schedule somewhere…and if it doesn’t, we let you know! Aspire supports multiple schedule boards by route or department manager. You simply drag and drop tickets onto the board to assign a service/job to a crew. The result is better delivery and timeliness. Contract service work is recurring with as many as 52 tickets in a year for weekly maintenance or mowing. Instead of scheduling these services by drag-and-drop weekly, you set up the recurring schedule one time and use the Rain function to alter days as needed. Yes, you can easily alter routes, too, by combining drag-and-drop with a recurring schedule. And even though the estimate produces a standard hour per visit, the Aspire Services Schedule allows you to vary that standard hour per visit to address seasonality differences. You get complete flexibility as well as discipline in managing hours. Snow is not scheduled like landscape work. It just happens…or in some years, it doesn’t. So when it comes to snow, the Schedule Board can be set up for standard routes for a team or manager or you can elect an event schedule set-up. Since snow is crazy with so many variables, we provide flexibility in these two different ways to schedule. Snow estimates, like any other ticket, are linked to the estimate and pricing outlined in your contract so you still have hours and materials by occurrence for the crew mobile interface. You just set the time app to Snow Mode in Aspire. The work ticket is the heart and soul of job costing. 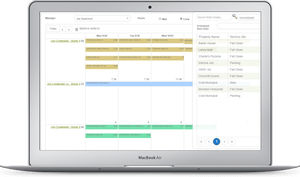 The ticket is a live document in Aspire where at a single glance you can review and monitor budgets, schedules, hours used and remaining, materials, and revenue earned and invoiced on a job. Aspire uses earned revenue to provide you with a true job cost to compare with your estimate. This reporting is a simple drill-in view in real time. Even better the drill-in view connects you with actual time cards and purchase orders. Pretty cool! And if there is no ticket but you still do work, Aspire will create the ticket on the fly! Most managers want to know more than a simple labor and schedule forecast (which Aspire displays). They also want to be alerted to scheduling problems before the customer calls and complains. That is what dashboards are designed to do – provide your people with real time updates on ticket status. Pretty good information for the crews and the AM’s who need to keep the customers happy and avoid those negative phone calls. No more “Throw it over the wall and hope for some communication from Production.” The ticket is integrated in real time with the crew mobile app, estimating, purchasing and inventory, as well as payroll and invoicing. This structure eliminates duplicate data entry from different spreadsheets as you try to manage the job, bill it and cost it accurately. Aspire’s integration reduces administration low value work and puts pressure on the Operations staff (where it belongs, by the way) to manage time and materials accurately during the day. See how Aspire improves work crew efficiency.